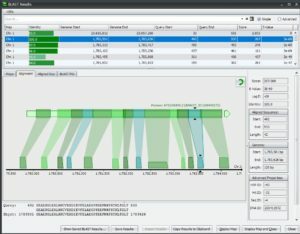 The trial version of Persephone has many useful features; here are some highlights to get you started. Physical and genetic maps are aligned on the same screen. You can visualize the entire chromosomes and display several maps on one screen. Persephone can show genetic and physical (sequence-based) maps. When the maps are added to the main stage, Persephone will arrange them vertically. This orientation is typical for genetic maps, it facilitates an overview of the chromosomes and their syntenic relations. Please note, that you can also display a portion of a physical map in a more traditional for sequences horizontal view (described later). The maps are grouped into map sets, that usually correspond to a particular version of genome. The map sets are organized into a tree shown on the left. Align genetic and physical maps of Zea mays. – this will fix the map, so that it will stay on screen when another map is added. The maps are shown in a form of movable “plates” with tracks of different types. The plates can be scaled by using the mouse wheel. You can move them around by dragging with the left mouse button. A roll of the mouse wheel outside of any map, on an empty background, will scale all maps together. Dragging the mouse while holding Shift will define a region of the map to zoom into. Open any map of the map set Homo sapiens/Human GRCh37.p13. It will be shown with several tracks visible by default. Move the mouse to a set of LED-like bubbles in the track panel on the left. The list of available tracks will automatically expand on mouse-over. A click on a track name will turn the track on or off. Alternatively, you can control the track visibility via context menu called by clicking the right mouse button on a track. Please note, that you can also define which tracks appear by default. To do this, click the right mouse button on the map set in the tree and select “Define default tracks”. To switch to more traditional for sequences horizontal view, select a portion of the physical map by dragging the mouse over the map while holding Ctrl key. Click the selection in the ruler track to open the horizontal view. Alternatively, you can use Horizontal view item from the top menu and move the mouse over the map. In this mode, a highlighted region of the size of 1 Mbp will follow the mouse until you click the mouse button again. In the sequence view, the shortcuts are the same as in vertical view: Shift-drag mouse to select the region to zoom in, Ctrl-drag mouse to select a sequence fragment, use the mouse wheel to zoom in/out. The selections in the graphical part are synchronized with the selections in the text. Now you can change the display mode of tracks (blue buttons), remove the tracks (red button), re-order them by dragging the handle or resize some of the tracks by moving their bottom edge. You can also collapse the tracks, if a “summary” view is enough for you. Find a little button ‘-‘ or ‘+’ on the left to collapse multiple genes into one-level track. All features that have been cut out will produce a shadow with a density reflecting the number of hidden elements. 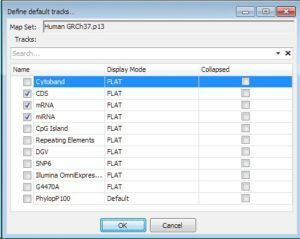 A click on a gene, marker or other object displays detailed information. 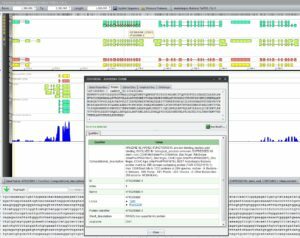 It includes associated sequences, orthologs, all locations of the feature and other properties. 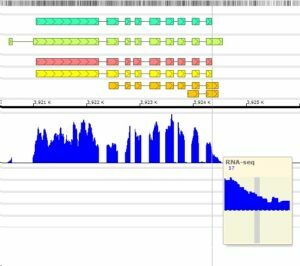 Various types of gene sequences are generated on the fly from genomic sequence and available exon and CDS coordinates. For maps, map sets or tracks, the properties are available on the right mouse click – see Properties menu item. 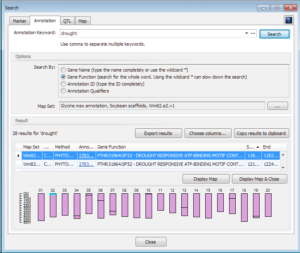 Real-time BLAST provides quick similarity search for a protein or genomic region. Interactive graphical output of BLAST results facilitates analysis of the matches. Click Alignment tab to see which parts of the query sequence produce high-scoring pairs (HSP). If you prefer looking at long text strings, you can also view the raw BLAST output. 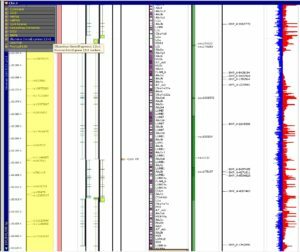 Open Arabidopsis thaliana Chr.1 map and zoom to any gene in a CDS track. The Gene Details form will show three tabs with sequences. Let’s take a protein sequence. Each sequence tab has a button Run BLAST. It is a shortcut that will transfer the sequence to BLAST form. Click this button. Choose TBLASTN as a program and find Arabidopsis thaliana in the list of available map sets. (We know for sure that the selected protein was generated from this map set, so we expect to see a good match). Please note, you can take BLAST command line parameters under control, if you check the “Override arguments” check box. Click Run button to start the search which usually takes a few seconds. The results of the search are presented in a graphical form. If you would like to come to this results later, use Save Results button on the bottom of the form. Numerical values plotted vs. genomic coordinates are shown as quantitative tracks. 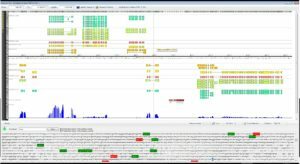 Persephone can show charts with one nucleotide resolution. RNA-seq data is a good example of values shown in quantitative tracks. The values in the quantitative tracks can be normalized based on the maximum value per entire chromosome or on the values in the visible part of the track. Please see Tools/Settings/General display tab. It has a check box “Dynamically scale BedGraph values to viewport”. Persephone will recognize Excel files (.xlsx, .csv) with mapped features. Quantitative tracks can be imported as bedgraph files. 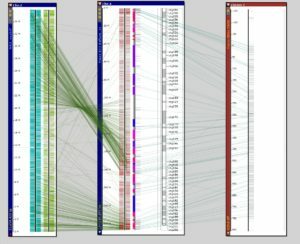 You can also visualize SNPs from VCF files. The import procedure is initiated by dragging & dropping the files onto the main Persephone screen. map name, feature name, start position, end position (optional) and track name (optional). Drag and drop this file onto the main Persephone screen (Map tab) – make sure that you close Excel before the procedure, otherwise the locked file will not be recognized. A form will open suggesting to select a map set where the tracks will appear. Note, that the map name in the file should match the names in the database. Select Sorghum bicolor Sbi1 from the map set tree. The coordinates in the graphics on the bottom will be adjusted according to the selected map. Click the chromosome graphical element in the bottom panel and press Show Selected Maps button. The map with the newly added tracks will be shown. The external files, imported in this way, will be listed in the map set tree under External Data node, so that you can always recall your data without going outside Persephone. The search for Persephone objects is partitioned into several sections: search for a marker, an annotation, a QTL or a map. The search keyword can be entered as the whole word or as a partial token with the wild card (*). For example, your search criteria could be a full name of a marker, like ‘txp71‘ or a name mask ‘txp*‘ which should find markers with the name that starts with ‘txp‘. Using the wild card is sometimes important, as, for example, the gene names quite often include extra numbers specifying the splice variant (At1g01010.1). 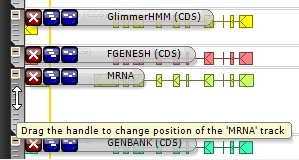 In this case, to find the transcript by gene name you will need to enter the name with the asterisk: ‘Atg01010*‘. In general, most of Persephone objects, besides required attributes like name for markers or genomic location for genes, have optional properties, called qualifiers. Some of them have special meaning, like gene name or functional annotation. So, you can search through all available qualifiers or, if you are searching for a keyword in gene functions only, you can limit the search space by selecting ‘Gene Function’ in the search options. 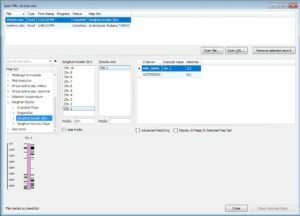 Besides using the QTLs tab in the Search form, which is suitable for a quick search for QTLs by name, we have a separate tab (QTLs) with QTL browser in the main screen. Please note, an additional way to display information about a list of objects is available via the main menu item Tools/Get details for the feature list. This interface will allow you to compose and export the output in a format that contains only those fields that are needed. Sometimes the function can be described by different but similar words. For example, to search for genes related to transposons you can use a keyword with the wild card: ‘transpos*‘, which should detect the genes that have ‘transposon’, ‘transposase,’ or ‘transposable element’ in their description. Select Annotation tab in the Search form. Choose ‘Gene Function’ radio-button in the Options section. Type ‘transpos*’ in the text box. Click the button near the Map Set selection to specify “Tomato SL2.40” map set. This will narrow down the search results to the selected map set. Click Search. The results will be shown in the grid and in the graphics below.